IMPORTANT: All campers MUST have a current Asthma Action Plan and Immunization Record to attend Camp. You may upload them with this application or send them later by fax, email or mail. IMPORTANT: All campers must be DC residents. 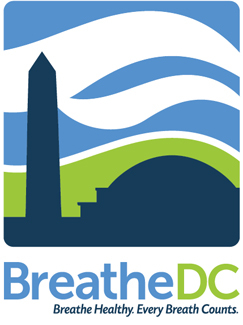 We will not approve your application if your child is NOT a DC resident. IMPORTANT: All campers must have an asthma diagnosis. We will not approve your application if your child has NOT been diagnosed with asthma. IMPORTANT: Applicants for Camp Breathe Happy must be first-time participants. We will not accept children who have attended camp in the past. IMPORTANT: Camp Breathe Happy is for children ages 8 to 12. All campers must be at least age 8 on 7/21/2019. Campers who will turn 13 during camp are not eligible, so your child must be no older than 12 on 7/25/2019. We will NOT approve your application if your child does not meet the age requirement. Parent or guardian, please share your thoughts on the following questions. Please share with us if your child is currently dealing with any special life issues? Please list all sports, hobbies, crafts, and social organizations in which your child has participated or other activities your child enjoys. Does your child have any specific medically-related restrictions that will limit him/her from participating in physical activities? Please specify. Enter a number. If none, enter zero. Please tell us the dates and reasons for hospitalizations in the past year. List the 3 most recent hospitalizations, for any reason. If not, please enter None. Please list all medications your child takes. Include injectable drugs if these are needed. If yes, can your child fully administer his/her injections? How often does your child experience the following side effects from his/her medications? I hereby grant permission for my named child to receive any medication listed below on this form, as deemed necessary. I have checked those medications I wish to be made available to my child. I understand that generic equivalent medications will be used in place of more expensive brand-name items. None - I do not approve any medication to be given to my child. I understand that Camp Breathe Happy medical staff will administer the above medications I have checked. IMPORTANT: Please provide a copy of your child's Asthma Action Plan and Immunization Record. You may attach these here or send them by mail, email or fax. Is there anything else that you feel would be helpful for us to know about your child? Thank you! This information will help acquaint us with your child prior to camp and will assist us in providing a positive camping experience for him/her!